Immersive Reader is a free add-in for Word, OneNote, Outlook, and Edge enables students to have articles read aloud to them at pace that meets their needs. Additionally, Immersive Reader will identify individual syllables, highlight each word as it is read, and identify parts of speech for students. It has become my go-to recommendation whenever I'm asked to recommend an accessibility tool that has either text-to-speech capabilities or readability enhancement capabilities. This week Microsoft added three more options to Immersive Reader. First, Immersive Reader will now highlight adverbs. You can activate this option in the "parts of speech" menu in Immersive Reader. Second, there are new color palette choices in Immersive Reader. This gives users more control over contrast and text visibility. The third new option is the ability to have parts of speech labels displayed in Immersive Reader. These labels are in addition to the color-coding that is already in place for parts of speech highlighting. These new Immersive Reader options are available in Word Online, OneNote Online, OneNote for Windows 10, OneNote for iPad, OneNote for Mac, and Outlook in the Web. 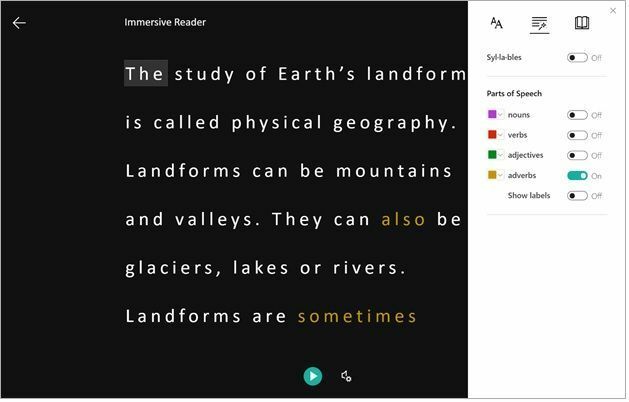 Immersive Reader is a part of Microsoft's Learning Tools.